Maintaining and cleaning tiles and grouts can be messy work and take up valuable time that you don't have. For some, this task remains on the "to do" list for years and never seems to get done. Polished and colorful ceramic tiles housed within clean looking grout borders add a touch of sparkling charm to your home. Call on the Los Angeles Carpet Cleaning .us tile cleaning experts to restore your grouts and tiles to their original lustrous beauty. We will come to your home or office and get the job done-quickly and professionally. Your tiles will once again look exquisitely colorful and decorative. 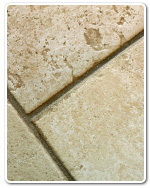 You should periodically clean and maintain your ceramic tiles for them to look their best. However when floor, wall or countertop tiles demand professional attention, trust Los Angeles Carpet Cleaning .us to provide you with the best service in town. You can rely on us get your tiles and grout looking brand new. If you would like to try grout cleaning by yourself, try this: Before grout cleaning, wipe away excess wet buildup with paper towels or a white terry-cloth towel. If grout is crumbling, consider replacing it. 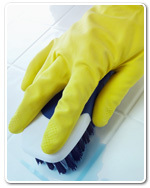 When cleaning, make sure to wear rubber or latex gloves and safety goggles. Open all windows to avoid exposure to the harsh chemical fumes of bleach-containing solutions. Wipe out mold, mildew or tough stains with a bleach-containing cleanser, or you can make your own by using 1/4 cup (2 fl oz/60 ml) of chlorine bleach and 1 qt. (32 fl oz/1 l) of warm water. Let the disinfectant sit for at least 10 minutes to thoroughly kill the mold and mildew. The grout should now be shiny and clean. Make sure to keep it that way. Apply one to three coats of commercial grout sealer with a small brush or paintbrush.